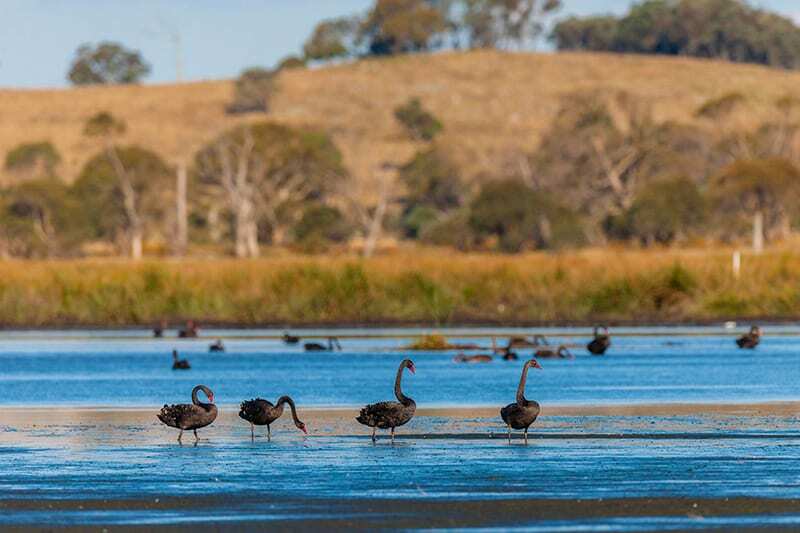 The Glen Innes Highlands is a wonderful place to enjoy a diverse range of birdwatching. The great thing about staying at the Rest Point Motor Inn is you have a comfortable place to stay after a long day out with the birds! You can also take advantage of the Hereford Steakhouse Char Grill with a delicious meal and a drink to celebrate all that you have managed to see. The Beardy Waters Dam is one of the best places to birdwatch. There is a great diversity of wildfowl and there is always a chance of something unusual dropping in! To view the entire dam, it is recommended to visit two areas. Firstly, the Shannonvale Road bridge and then the Beardy Woodlands Reserve. At the reserve you will find picnic shelters and toilets. If you are lucky you might even see a Platypus in the river. Birds seen include: Little pied, littleblack, pied and great cormorants, little, intermediate and great egrets, darter, yellow-billed and royal spoonbills, straw-necked, sacred and glossy ibises, hardhead, shoveler, musk, blue billed and pink-eared ducks, little and wedge-tailed eagles, red-kneed and black fronted dotterels, sharp-tailed, pectoral and marsh sandpipers, painted and Japanese snipe, black winged stilt, whiskered tern, restless flycatcher. Wellingrove Fossicking Area – there is a brochure available at the Visitors Centre and the National Parks office. Wellingrove Fossicking Area is an area of mixed woodland surrounding a gully that is also popular with fossickers. There is a picnic area and toilets for visitors. Birds seen include: Little and musk lorikeets, king parrot, fan-tailed cuckoo, rufous whistler, buff-rumped and yellow rumped thornbills, varied sitella, brown and white throated treecreepers, white-naped, white-plumed, white-eared, yellow-faced, fuscous and regent honeyeaters, eastern spinebill, mistletoe bird, spotted and striated pardalotes, red-browed and diamond firetails, speckled warbler. Kings Plains National Park is a beautiful area of eucalypt woodland along with casuarinas and wattles and some heath surrounding pools and falls on Kings Plains Creek. You will find a scenic picnic area on the banks of the creek. Birds seen include: Little and musk lorikeets, scarlet and eastern yellow robins, rufous and golden whistlers, speckled warbler, honeyeaters including yellow tufted, spotted pardalote, dusky wood swallow, double-barred, red-browed finches, white-winged triller, chestnut-rumped heath wren. This is a woodland area consisting mainly of eucalypts with abundant mistletoe and acacias. Enjoy the beautiful views from the top looking west over the Matheson Valley. Birds seen include: Wedge-tailed eagle, eastern and crimson rosellas, yellow-rumped and buff-rumped thornbills, white-naped, yellow-faced, white-eared honeyeaters, eastern spinebill, mistletoe bird, golden whistler, white-winged chough, spotted and striated pardalotes. This is a road that takes you through farmland and woodland areas and occasionally follows a shallow creek. The variety of habitats provides for many species of birds. Birds seen include: Wedge-tailed eagle, Pacific baza, yellow-tailed black and glossy black cockatoos, rainbow, musk and little lorikeets, king and turquoise parrots, channel-billed cuckoo, rainbow bee-eater, dollarbird, hooded and eastern yellow robins, restless flycatcher, white-throated and brown treecreepers, honeyeaters (including scarlet), apostlebird, diamond, plum-headed and red browed finches, tawny frogmouth. Washpool, Gibraltar Range National Parks – there is a brochure available at the Visitors Centre and the National Parks office. These National Parks provide two areas of wilderness where many bird species not normally seen further west, can be found. Picnic facilities are available in both parks. Birds seen include: Grey goshawk, brush-turkey, Wompoo fruit-dove, topknot pigeon, brown cuckoo-dove, glossy black and yellow-tailed black cockatoos, king parrots, superb lyrebird, brush cuckoo, noisy pitta, rufous scrub bird, cicada bird, White’s thrush, pale yellow robin, black faced monarch, rufous fantail, eastern whipbird, southern emu-wren, large-billed, white-browed and yellow-throated scrub wrens, brown gerygone, yellow and striated thornbills, little wattlebird, Bell miner, Lewin’s honeyeater, figbird, green catbird, spangled drongo, satin bowerbird. Mann River Nature Reserve – there is a brochure available at the Visitors Centre and the National Parks office. Mann River Nature Reserve is a scenic area with rugged terrain contrasting with peaceful river flats. Fireplaces and toilets are provided on the reserve which makes it an ideal spot for picnics. The waterholes are also suitable for swimming in our warmer months. Birds seen include: Little pied cormorant, straw-necked ibis, common koel, azure kingfisher, rainbow bee-eater, dollarbird, spotted quail thrush, rose robin, golden and rufous whistlers, red backed fairy wren, speckled warbler, spotted and striated pardalote, red-browed and white-throated treecreepers, red-browed firetail, yellow-faced honeyeater, eastern spinebill, Torresian crow. Little Llangothlin is a highland wetland Nature Reserve that attracts a variety of wildfowl and waders. Birds seen include: Australasian grebe, white-faced and white-necked herons, black swan, black-winged stilt, Japanese snipe, swamp harrier, grey teal, black and musk ducks, black fronted dotterel, varied sitella, grey butcherbird.